Four Directions completes expansion, fulfilling a Queen’s Truth and Reconciliation Commission task force recommendation. 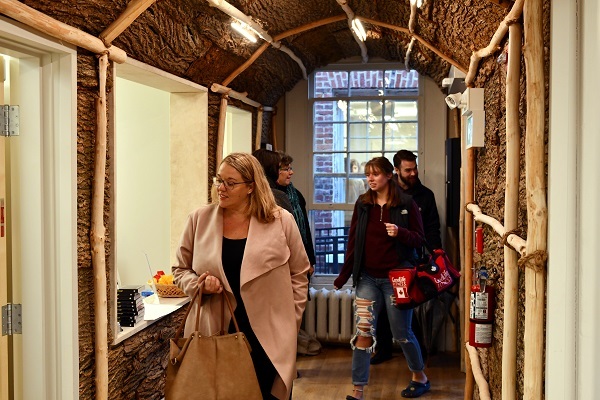 A key recommendation of the Queen’s Truth and Reconciliation Commission (TRC) task force report became reality on Monday, as the recently renamed Four Directions Indigenous Student Centre opened its newly expanded doors. In the spring, 146 Barrie – the original home of Four Directions – and neighbouring 144 Barrie Street were stripped down to the plaster. Contractors updated the insides of the two 19th-century homes and, yesterday, the updated interiors were shown off at an open house. The ground floor of 144 Barrie includes an expanded kitchen and programming space. It has a longhouse aesthetic paying tribute to Haudenosaunee peoples. 146 Barrie, meanwhile, honours Anishinaabe peoples with a circular room for cultural and ceremonial events, along with a library and quiet study rooms for students. On hand to celebrate the rejuvenated and expanded facility were members of the Aboriginal Council of Queen’s University; members of the local Indigenous communities; Indigenous students, faculty, and staff; and key members of the Queen’s executive team. The Queen’s TRC task force report which was titled “Extending the Rafters”, called for more space for Indigenous students on campus. Recommendation 13 specifically called on Queen's to "Expand Four Directions [Indigenous] Student Centre and ensure that it is appropriately staffed and resourced to adequately support expanding enrolment of Aboriginal students". "The recommendation that the Centre be expanded was very much reflective of the needs of Indigenous students," says Lauren Winkler, a student member of the TRC task force. "Four Directions is known as being a "home away from home" for Indigenous students and now there is more space for our community to grow and thrive. Not only do we have more space, but this space was designed with us in mind. Having a space that is reflective of our different cultures really shows us that there is space for us on a campus that often acts as an overwhelming reminder of our colonial histories and present-day realities." The project was funded by the Division of Student Affairs and also received support from the federal Enabling Accessibility Fund for upgrades that have made both buildings more accessible, including two washrooms and kitchen. To learn more about Four Directions Indigenous Student Centre, visit www.queensu.ca/fourdirections or visit 144 and 146 Barrie for a tour of their updated home.